For those of you that have been following me a while, you know that I'm following the old Weight Watchers Point System. You also know that I like mashed potatoes. A lot. Which is why this recipe is such a winner for me. It has all the flavor with no unnecessary added fat or calories. If you've been depriving yourself of your favorite comfort food, do your happy dance right now. This recipe is deprivation free. Preheat the oven to 350°F. Wrap the garlic head in aluminium foil; bake until the cloves are soft, 45-60 minutes. Let cool 10 minutes; squeeze the pulp from the cloves into a small bowl. In a large pot, combine the potatoes, bay leaf, ¼ teaspoon of the salt, and enough cold water to cover; bring to a boil. Reduce the heat and simmer and cook until the potatoes are tender, 10-15 minutes. Drain, reserving the cooking liquid; discard the bay leaf. 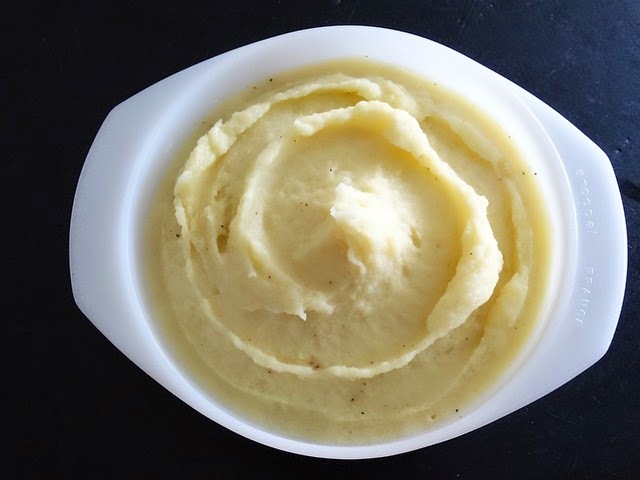 With a potato masher or an electric mixer at low speed, mash the potatoes with the garlic, buttermilk, and the remaining 1/4 teaspoon salt; thin with the cooking liquid if needed.